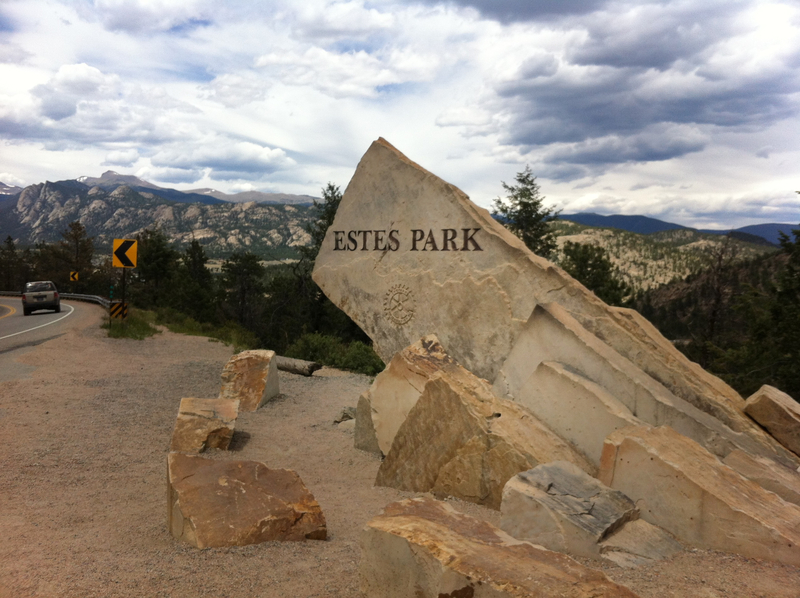 Coming from Denver, Estes Park is about 65 miles. The hour and a half drive starts out on straight flat highway with the Front Range of the Rocky Mountains rising up out of the western landscape. It’s stunning really. I’ve done this drive once before and have also approached Denver by train. You just wonder if the locals are as enthralled with the site of those snow capped, gianormous rocks as the visitor is. Miles before Estes Park the road narrows and begins to wind through the mountains. Then all at once it appears with a marker sign and roadside pull-off to preempt the view. 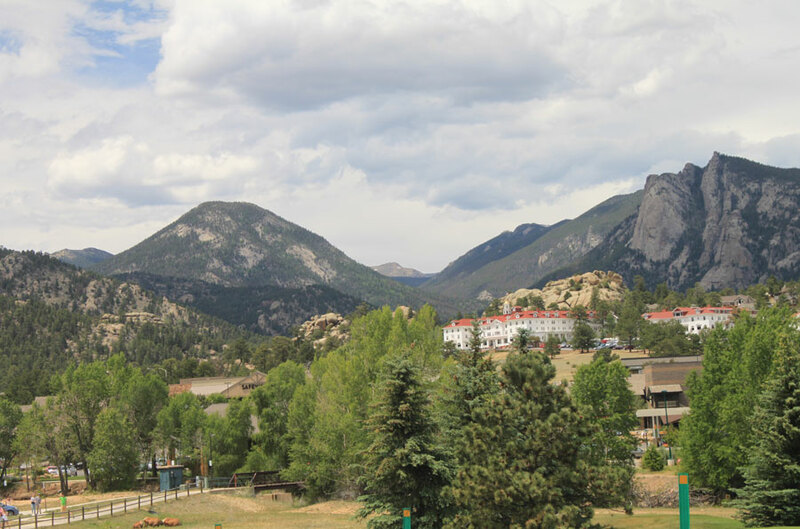 Estes Park spreads across a valley with shops,parks, buildings and the Stanley Hotel presiding over the view. All that with the jagged Rocky’s on the horizon. Estes Park is touristy town. One shop owner told me that the town literally dies after November. 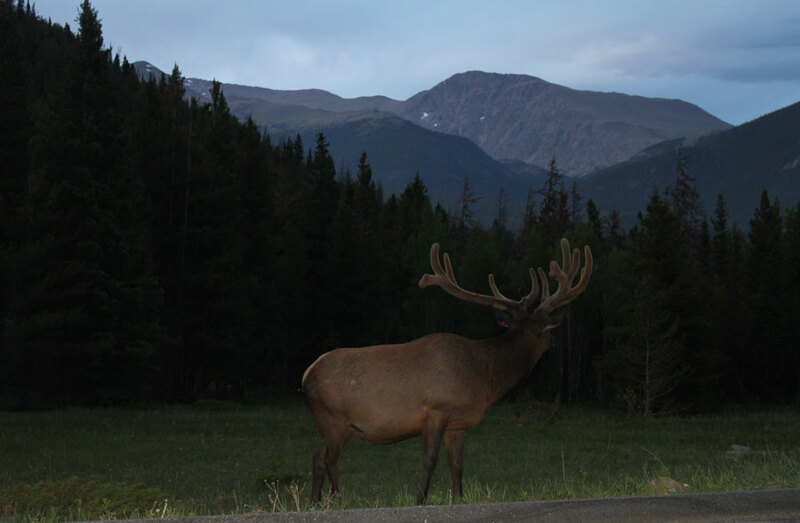 Rather than being a ski-resort, it’s a home base for visiting Rocky Mountain National Park and driving the Trail Ridge Road which winds across some of the highest parts of the mountain range. It is the highest continuous highway in the United States. Small hotels, lodges, cottages, campgrounds and self-catering facilities abound in Estes Park, as do shops, restaurants and stores that cater to hikers and outdoors-people. The Stanley Hotel dominates the Estes Park skyline. It’s perched above the town in full view, wedged into the mountainside and it enjoys its fame as being the inspiration for Stephen King’s book, The Shining. The Stanley has a full service restaurant and cafe, and it offers a variety of tours daily – some of which are booked months in advance. 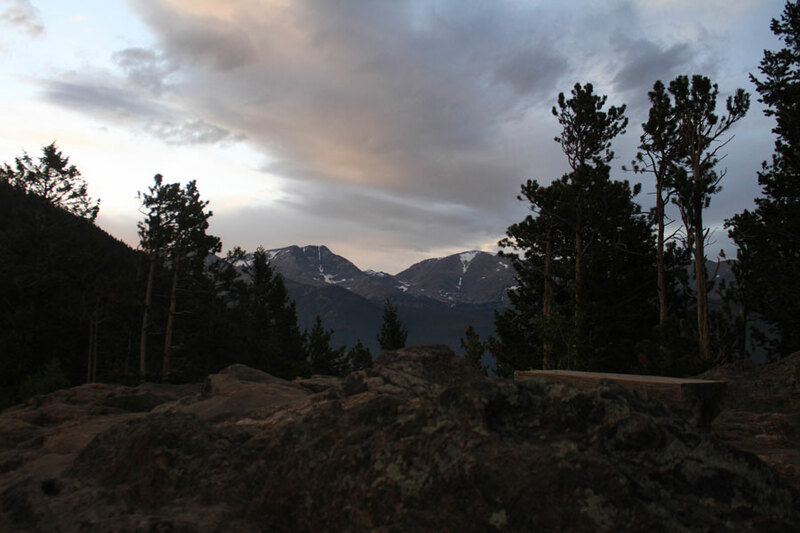 The biggest attraction of Estes Park is undoubtedly Rocky Mountain National Park. The east entrance is just outside of town and the ability to simply drive through this wonder is worth the visit to Colorado from wherever you live in the world. There’s no place quite like it. As soon as the visitor begins the drive, the images almost assault the eyes. It’s hard to take it all in, especially if you live in an area so flat that kids have to tie their sleds up to pick up trucks and get pulled in order to go sledding when it snows. But that same calm that grips travelers once they cross the Chesapeake Bay finds the visitor that enters Rocky Mountain National Park. The visitor can’t fight being changed. A change in altitude can be problematic for some – me included. I came from sea level in the morning to Denver (5200 feet above sea level) 4 hours later. Then three hours after landing in Denver, I entered Estes Park which is over 7000 feet high, and two hours after that I was on the Trail Ridge Road ascending to 10,000 feet. (At the tundra level, Trail Ridge Road reaches higher than 12,000 feet). That big a shift in altitude in one day can be a shock. 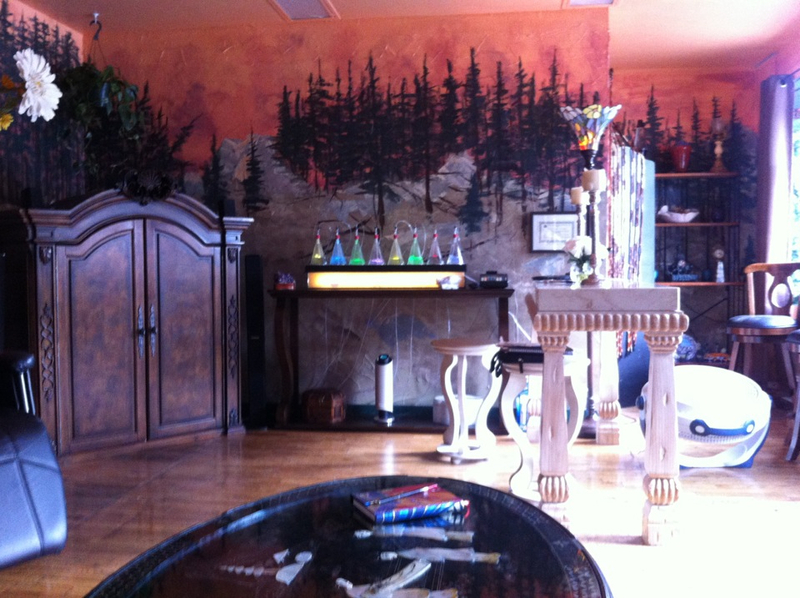 Tess at The Oxygen Sanctuary in on Moraine Avenue offers 25 minute treatments for altitude acclimation. I was amazed at how much better I felt. It’s definitely worth the investment. I had the treatment before ascending up the Trail Ridge Road. Today, I’m headed for the Stanley Hotel and a History and Ghost Tour. If you like this post, SUBSCRIBE by email for updates (free). Writer, author, blogger, wife, mother, grandmother, lover of wide open spaces, trains, shorelines, Ireland and people. Maryland will always be home, but I'm never really happy unless I'm on my way to ... somewhere. Gerald, thanks so much for stopping by this blog and for your kind words. I love driving through that part of the Country. We also loved Glacier and Cheyenne. Happy travels. Can Fat Girls Ride Bikes?